As you might have guessed, I went out of town for Thanksgiving. I ate everything, and now there is no food left in the United States. Thanks, Donald. Gosh. While I was gone, I finished my quilt and also binged on Netflix's The Crown. The quilt is in the washing machine as I write this, but I shall post a photo of the finished product soon enough. The Crown was excellent, but I need more episodes immediately. I highly recommend it. My mom and I watched the whole thing in a matter of two or three days. That's how I finished the quilt in such short order. My right index finger has a callus. 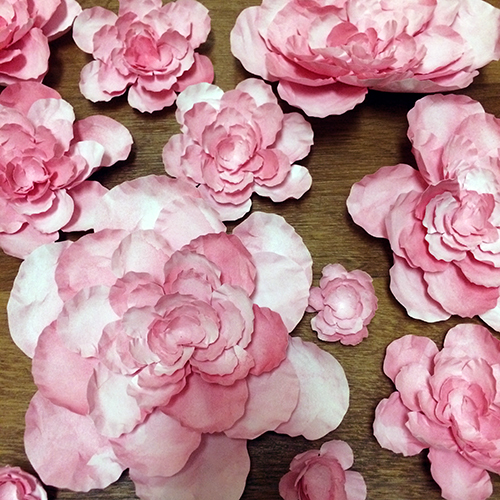 Above, you'll see a photo of one of my other recent projects, some watercolor paper flowers. They're not quite finished yet, but I think they look lovely. Today I start working on a list of Christmas orders. I'm thankful to have so much work this time of year. I should be busy up until the week of Christmas, I think. All right. Now I have to get on the treadmill. Happy Monday!